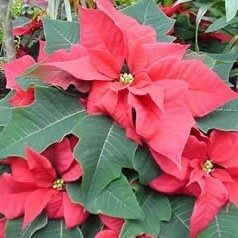 In its native Central America, the poinsettia is now classed as a weed, but the Aztecs knew the plant well and valued it greatly. They named it “Cuetlaxochitle” which means mortal flower. To them, it was a symbol of purity and a reminder of the blood sacrifice as well as being a valuable red dye and medicine against fever. Franciscan priests took over its symbolism when introducing Christianity into Mexico and changed its meaning from purity and blood sacrifice to represent the blood of Christ in their celebration of Christmas. The red coloured ‘flowers’ on the plant are actually highly coloured leaves called bracts; the actual flower is pretty insignificant and located at the centre of each bract. The plant needs to be kept moist but not waterlogged in an open, well-aerated compost. It must be kept in a warm spot away from draughts otherwise, leaf drop will occur. Poinsettias are photoperiodic and will only initiate their colourful bracts and flowers when the total amount of light they receive is less than twelve hours a day – making it the ideal Christmas gift! See ours in the Mediterranean House now.